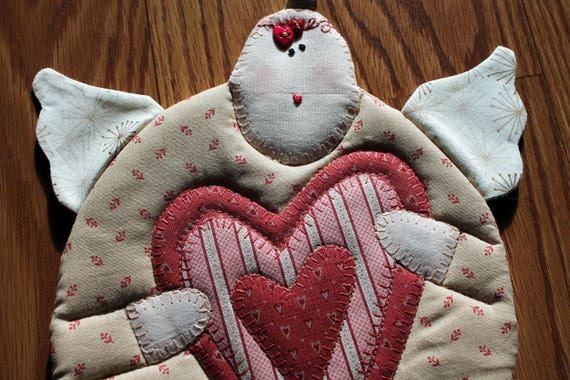 Set of two Valentine’s Day (or any day) machine quilted heart patchwork potholder hot pads. 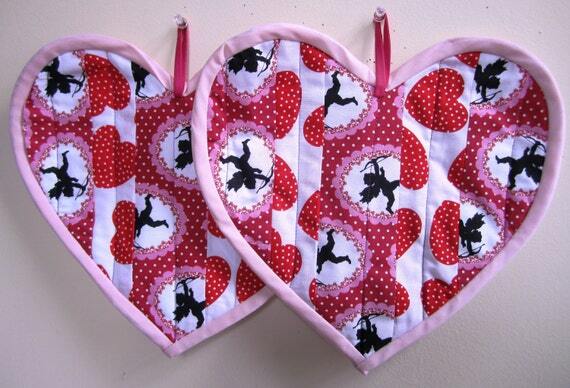 Hand sewn from retro vintage style prints in 100% cotton with hearts, cupids, and polka dots. Lined with cotton batting and insulated heat proof padding. Backing fabric is a small white heart print on a dark red background. Securely edged with coordinating pink binding and includes loops for hanging. Pretty up your kitchen and table with this long-wearing set! Each set is different. Set of 2 handcrafted quilted potholders measure approximately 9 1/2x 9 1/2 inches. These are oversized and may also be used as Hotpads or Trivets to protect table surface. Because this is handcrafted, there likely will be slight variations in measurements. Print is of Red Cupids with Bow against a White Background (See close-up for detail) Constructed of 100% Cotton with Interior Cotton Batting and Insulbrite for Insulation and Fire Retardency. I am pleased to offer free shipping! Custom orders and requests welcome! Fast turnaround time! 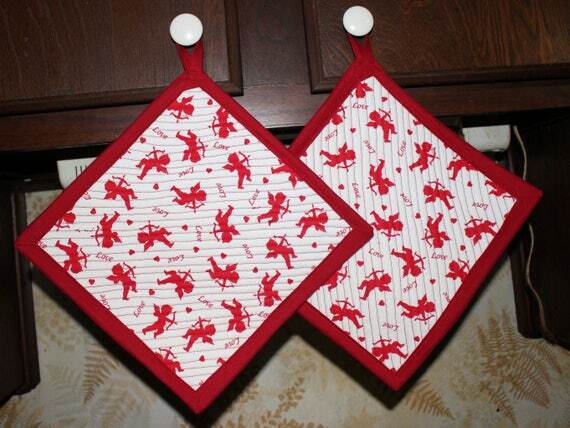 This Cupid pot holders will add a touch of love to any kitchen. It measures roughly 10″x7 1/2″ and are made with 100% cotton fabrics. The rich country colored fabrics are quilted through three layers of cotton batting. They would be a great addition to a housewarming gift basket for a friend or new neighbor. Maybe just treat yourself to something new to replace those old stained ones in your drawer. They are useful as decor, a mug rug, hot pad, snack mat or trivet –however you choose to use them, they are sure to lift your spirits.